If you have magic rectangles on your roof that turn sunlight into electricity, you probably want to make sure they get plenty of sun. You probably would go out of your way to make sure nothing else on your roof is casting shadows on them, right? But that’s pretty hard, on an RV roof. There’s not much space, and lots of other things up there to cast shadows. So what about little shadows? Exactly how much do you need to freak out about shading on your solar panels? As we’ve traveled, I’ve seen a lot of different approaches to solar power. Some are slick, some are hilarious, some are impressively resourceful, but the majority — and I mean almost every single one — display obvious shading issues. That even includes our Toaster! The usual culprits are A/C shrouds and opened vent covers. But I’ve seen antennas, lawn chairs (in front of ground-deploy panels), and even other solar panels casting dark smears across their neighbors. Aren’t these people disappointed in their system performance? Or is this shadow paranoia just (another) example of my obsessing over technical minutia? I decided to do a little experimenting and see for myself. Here’s a write-up about what I found. Each of our solar panels has 72 clearly-visible subdivisions on it. Each of those is one “cell”, generating 0.5V of electricity. Those small cells are all combined together to make one solar panel which puts out about 36V at peak conditions (0.5V x 72 = 36V). This is considered a "24V" panel because panels have to be able to put out more voltage than the systems they are meant to charge. You may be more accustomed to seeing panels with only 36 cells on each one – that is a “12V” panel, and it will be rated to make about 18V peak (0.5V x 36 = 18V). 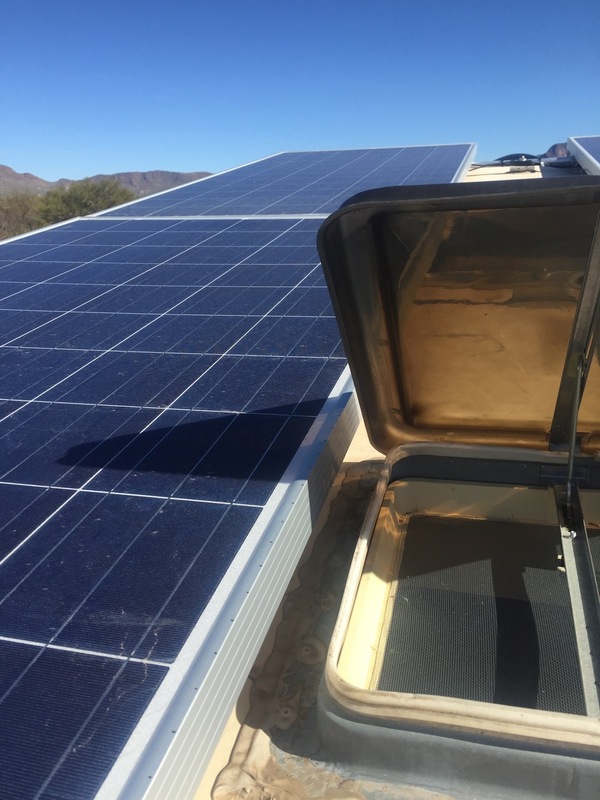 Using 12V or 24V panels is a decision you make when designing a solar setup, something I talk about more in this post. But shading applies equally to any type or size of PV panel. Wait for a very clear day so haze and clouds won’t create a lot of variations. Also wait for the sun to be nearly overhead, so changes in the angle of the sun between measurements will be minimized. Ensure battery bank is partially depleted (80%-90%) so the charge controller is actively charging throughout the experiment (otherwise the charger’s output current won’t be a useful measurement). Connect to charge controller with laptop to monitor system values. Trip the breaker on the string which won’t be tested. Verify that the correct breaker was tripped by covering one of the panels under test with a towel and confirming that output drops off. For the actual test, I made marks in one-inch increments up both sides of one solar panel, starting at the bottom edge of the actual PV cells (the blue stuff). Then, using gorilla tape, I secured a towel so it lined up with each set of marks in turn, creating a shadow of known dimensions on the panel. I then checked the output of the array in the charge controller’s software. Having measured the width of the solar panel’s actual power-generating area (again, the blue stuff) at 37.5 inches, I can find the shaded area by multiplying that by the number of inches the towel covers. What I see in these results is the array’s power dropping off quickly with the first few increases in shading, then holding steady at about 50% of the no-shade power level. So basically, there is some amount of shading which “turns off” that panel. After that point, there is nearly no change in the array output because once that one panel is “off”, only the remaining (unshaded) panel is doing anything. These results make the shading effect appear linear (although there’s not really enough data points to draw statistically significant conclusions). The array output leveled off at 150W — I took enough additional readings to confirm this but trimmed them off this graph so I could fit a line to the data. These results show that after 3.5” of covering, that shaded panel is basically “off”. Our panels “turn off” with 131.25 sq.in. of shadow, on a panel with 2906 sq.in. of PV area. That’s a shadow covering 4.52% of the panel’s total area. I don't know exactly how this effect will vary across panel types and sizes…but if you’re looking for a ballpark figure, I’d bet that 5% shading is Bad News for most panels. Most of us don’t have to worry about towels on our roofs, so how does this relate to actual RVs? Let's look at our kitchen vent cover, which casts a shadow on the same panel I did the towel-tests on. This shading situation is something we knew would happen when we built the Toaster, but it was unavoidable so we accepted it, without knowing how big a deal it would end up being. The shadow can get quite a bit bigger, if the lid is opened more or the sun is lower, but this is typical of how we behave — during the hot part of the day, we may open it halfway. This shadow is 4.5” wide, 1.5” high on the narrow side and 3.0” high on the tall side: 10.125” sq.in. of shaded area on the panel. That is equivalent to just 1/4” of towel-cover. This string’s output with the vent open was 351W, verses 368W when I closed the vent — a 5% reduction in output. So I think we’re likely to continue opening that vent in the future, because it’s worth giving up that lost energy to keep our space cool. For those 17 lost Watts, we couldn’t run a fan to compensate for the vent being closed. This loss in solar production due to the small shadow also appears to agree with the curve I plotted above. Sometimes shadows can come from other panels on your roof. Here's a little tool I found that can help you figure out how far apart you should space adjacent rows of solar panels, to prevent them shading each other. By the way, if you’re wondering why that string is only putting out 368W when it’s made from 610W worth of panels, it’s because our array doesn’t tilt, and I did this test in mid-winter, so the sun is low. Also they were filthy, because I’m lazy this week. This is the part where the post goes off the tracks. Skip to the end if you’ve already had enough! If you want more detail, forge ahead. My experiment is very simplistic and doesn’t address all the facets of shading. For example, the shape and location of a shadow definitely have to do with its impact on the panels’ output, not just the simple size of the shadow (measured by area). This article does a pretty good job describing what I mean. In my experiment, the shading was applied starting at the bottom of the panel and moving towards the top. So the first row of solar cells were all partially shaded at the same time, until eventually the whole first row was shaded. Then the entire second row started to become shaded. This is pretty much the worst-case situation. If I had instead applied my towel by starting at one edge and moving it sideways, the results might not have been as dramatic. But, it’s much easier to simply measure the area of a shadow than to try and factor in the many facets of its shape and position – especially since they move and change shape throughout the day! Also, I don’t have a big enough towel to get more complicated. So I’m sticking with this simplistic approach, as a rough reference. DOES one shadow shut down the whole string? Modern panels have integrated bypass diodes. This reduces how much a shadow will impair output, by allowing electricity to bypass critically-shaded cells, rather than getting stuck behind them. Older panels with no bypass diodes would indeed have shut down the entire string as soon as one cell was fully shaded, just like it only takes one dam to stop the flow of a whole river. Check out the results above and notice that when the shaded panel “turns off”, the output voltage for the whole string also suddenly drops. In both data sets, the output voltage is 75V so long as the shading is minimal, but drops to 32V once the shading reaches the “turn off” point. Panels in series stack their voltages, so in the string making 75V with zero shading, each panel is contributing 37.5V (This is consistent with our panels’ 35.77V rating). So when the shaded panel “turns off”, why doesn’t the string voltage drop to 37.5V? Where is that 5.5V going? It’s those diodes. The bypass diodes will allow electricity to flow around shaded cells, but it takes some voltage to activate them. Think of it as a spring on a self-closing door – once the door is open, anything can pass through, but something always has to be pushing hard enough to overcome that spring or it will swing closed. The other panel in the string has to use up some of the voltage it’s generating to overcome the diodes in the shaded panel and still be able to push electricity down to the charge controller. The string is still producing power, and the whole thing definitely isn’t being shut down by shading (which is great news) — but it is crippled. If the un-shaded panel were all by itself, it would be making 188W, but now — because it’s wired to a shaded second panel — the whole string is only making 166W. Two panels are actually worse than one in this case (when one is shaded)! Here’s one way this could matter: Let’s say you want more power from your solar array and you’re considering adding a panel. Your charge controller can’t handle any more current, so you’ll have to add the new panel in series with an existing one. But the only place you have room would be shaded by the A/C shroud for part of the day. If you installed that second panel, your system would actually perform worse for the part of the day that it was shaded, even though it has more panels. If that shading only happens for a couple hours, then maybe it’s still worth it because of the increased production during the rest of the day…but if the shadow persists for several hours, especially during peak sun (around noon), the losses might outweigh the gains. With "12V" panels, the situation would be similar, with one added concern – the peak output of the array is not a whole lot higher than the voltage required to charge the batteries. Conditions are rarely good enough for panels to operate at rated voltage. A 12V array will often be making less than 16V. If you lose just 2V due to the bypass diodes on a shaded panel, you're already at 14V, and with other line and efficiency losses there’s no hope of pushing any charge into a battery bank. So in this sense, shading on one panel really would, effectively, “turn off” the whole string, from a battery-charging perspective. The energy would still be useful for running 12V devices, though. Any shading at all unquestionably reduces panel output, regardless of setup. At small levels of shading, the lost output is around 0.4W per sq.in. of shadow on 24V panels. I’d expect this to be around 0.2W per sq.in. for 12V panels (but have no data to support that). This will vary depending on shadow shape and location. At a certain level of shading, the entire panel is effectively disabled. This is about 5% of the total PV surface area for our panels, and is probably about the same for other panels (no data to support that). This percentage might be higher with more favorable shadow locations, but the real world is usually pretty pessimistic, so you might as well be, too. One shaded panel in a series-string decreases the string output below what it would be if the shaded panel were completely absent. One shaded panel in a series-string does not “turn off” the entire string, but in some conditions it can reduce output enough that the string's is unable to do any practical battery charging. Remember: This might look like science, but it isn’t really. Real scientists would do many things better, but they would probably also have a grant or something, and wouldn’t be living inside their experiment. Unless they were in Biosphere 2! If you’ve spotted some crazy solar-panel setups or major shading issues, post photos in the comments (there's a little button at the lower-left to attach images)!